Sky News uses LiveU for Royal Wedding video transmission. Hackensack, NJ, May 2018: With royal watchers around the world already captivated in the weeks leading up to the wedding of Prince Harry and Meghan Markle, the event itself was a huge television spectacle. 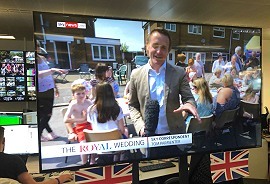 Sky News wanted to bring the wedding to their Sky Q customers in the highest quality possible, opting for a live 4K broadcast. They once again turned to long-time partner LiveU to add dynamic live coverage from outside their fixed Windsor UHD OB. The supply of the units and additional support was provided by LiveU UK partner Garland Partners.